Gifts from the Pirates: "There's so much more to a book than just the reading." "There's so much more to a book than just the reading." A few weeks back me and the awesomeness that is Emma from Another Last Story were talking about books and charity shops which we seem to do a lot when we get together as the two go perfectly hand in hand. Emma came up with the idea of a fun book related charity shop competition and after chatting about it a little, the day was upon us and it was time to put our plans in to motion. We met up on the morning of the great book off in Shrewsbury, where there are plenty of charity shops to mooch around. 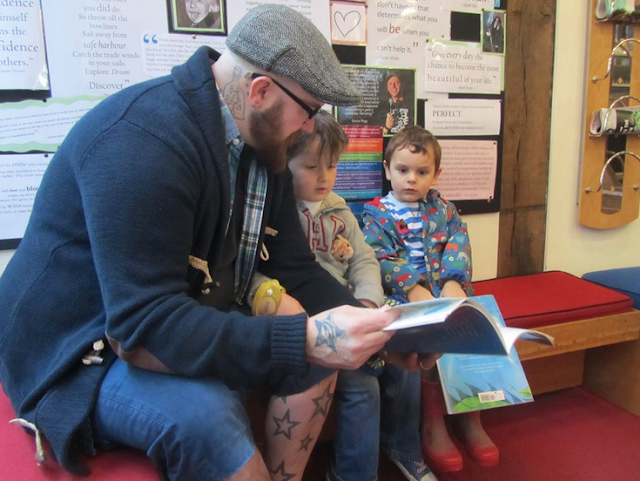 Before heading out and starting the competition though we popped in to the library with the boys to read a few books in hope that it would be a great start to an afternoon of children's literature. The plan was to hit the charity shops armed with £5. We had a list of rules, one adult book, a selection of children's books and one gifted book to each other, but minutes before we kicked off the fun we decided to just go and buy books, spend a fiver and meet up to compare our spoils. Emma threw a huge spanner in the works early on when she declared 'No Shoplifting!' so as you can imagine the fun started on a down note. There was a bit of smack talk before we kicked off but then we went our separate ways. We had roughly 40 minutes before meeting for lunch so we split up and me and Opeie hit the shops hard. Our first find was a book about Nessie which fit in perfectly with Mrs M working away at Loch Ness this week, It was a great way to start the hunt. We managed to grab some great bargains in what turned out to be the first leg of our book hunting adventure. The plan was to meet up at 12:00, i tried my luck with a text saying "how about 12:30" to which I received a rather blunt reply "12:00", that told us! We managed to grab Oliver Jeffers A way back home and a vintage nursery rhymes book that had seen better days but had a lot of character (I knew Emma would love it). We regrouped back at the library for lunch and added our friends Lucie and Martha to the fun. The smack talk continued and Lucie joined forces with Emma (because clearly she needed the help). Rose found a quiet spot for lunch on Charles Darwin, meow. With £1.50 left to spend it was time for round 2 and me and Opeie ventured to a different part of town where the charity shops are a little more classy. Opeie had set an extra task of finding a cool pop up book for us, which we did although it took us over our budget so we couldn't include it in the game. When I visit any charity shop I always have a few "Id love to find" books in mind. At the moment I keep hoping Ill stumble upon the Robert Sabuda pop up edition of The wonderful Wizard of Oz because I cant warrant paying the price it goes for online or anything by Florence Upton (I love those illustrations). We spent our remaining money on an adults Roald Dahl book for Emma that I had never seen before as I knew she was a big fan. Me and Opeie had come home from a morning out last week to find presents waiting for us from Emma and Matthew, which was so kind of them, so we thought it was cute to stick with the Roald Dahl theme. Part two flew by and we arranged to meet at Shrewsbury museum for what Emma called "an Opeie friendly hot chocolate" (Soya). As the kids sat and had what looked like a very sophisticated coffee date us adults filled the table with our findings and exchanged gifts. Emma had found us an atlas of Dinosaurs which went down a treat with Opeie and a copy of Mr Popper's penguins which me and Opeie are really looking forward to reading after we have finished James and the giant peach. Sophisticated and friendly hot chocolate aside it did get to that point in the afternoon where the winner had to be announced so we turned to the referee's that had joined us mid competition. While going through our spoils we found that the other team already owned our gifted Oliver Jeffers book so it went to Lucie and Martha which may have swung Martha's vote when she announced we had won. Thankfully though our awesome children decided that 'everyone is the winner' and rightly so if you can pick up that many amazing books for £5 how can you not be a winner. Our charity shop adventure was so much fun and we are now thinking about making it a regular thing as it will be interesting to see what we find in different towns. It looks like Bridgnorth may be our next destination so if you are from the surrounding area be generous with your book donations. ...and Emma pointed out 'There's a couple of Foxes over here! ', Love these guys!